A police station have released what is quite possibly the best display of lip syncing I’ve ever seen, with a video of their team miming along to Uptown Funk. 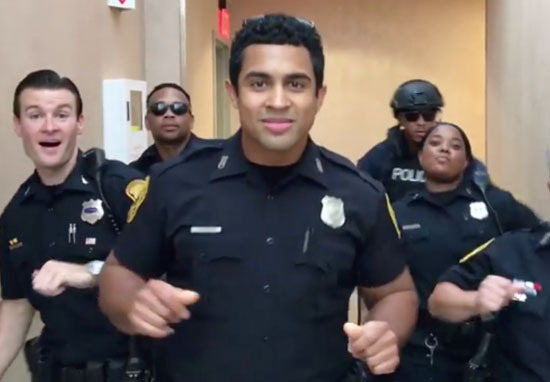 The town of Norfolk, Virginia, must be one with a very low crime rate, because the police officers in this lip sync video clearly had a lot of time to spare when planning and organising their routine. 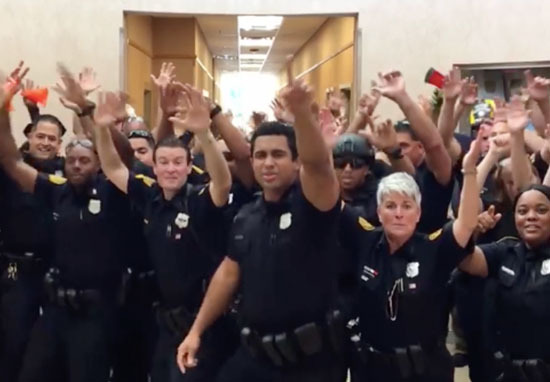 After being challenged by a police station in Corinth, Texas to complete the lip sync challenge, the team in Norfolk went all out to Bruno Mars’ ‘Uptown Funk’. The police station released the video on Monday on Facebook, and due to its undoubtable excellence, it has gone viral over the week. The fact that the video was filmed in one take emphasises the amount of planning that must have gone into the making of it, and ultimately makes the display even more impressive. There are perfectly timed entrances, a host of cone-playing trumpet-mimickers, and a room full of motorbikes with their lights flashing all on hand to make this lip sync challenge one of the most hilarious to date. The post was shared by Conrith Police Department, who challenged the Norfolk team to make the video in the first place. Norfolk PD responded to the challenge and brought their A game! Great song, strong choreography but they still don’t have Officer Dreamboat! ‘Officer Dreamboat’ presumably refers to one of the men in Conrith‘s lip sync video, a miming of of Miley Cyrus’ ‘Party in the USA’. While still an excellent display of police work, I think Norfolk’s video takes the lead for me. 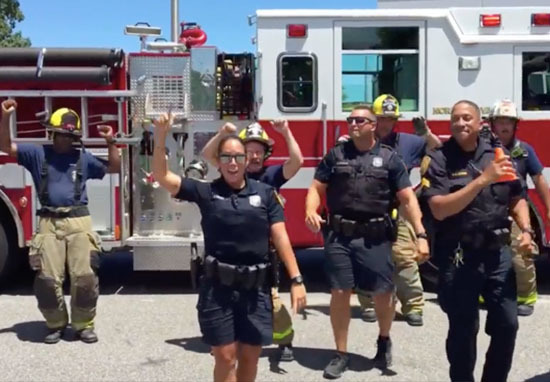 Norfolk’s lip sync video was highly anticipated, with the department initially releasing a video announcing the team’s acceptance of the challenge. The officer announcing the acceptance signed off with a hint to the Norfolk department’s song of choice – ‘don’t believe me? Just watch’. The post has received a wave of appreciative comments since it was posted, with viewers loving the display which united the entire department, including local firefighters. Because they just killed it! That was so much fun to watch. I’m 92 years old and I couldn’t keep my 92 year old feet still. They happily tapped along to the music, (I am sitting down, of course) otherwise I would fall over. LOL You are a very talented, entertaining group. I loved it. You put a big smile on my face. Thank you all and best wishes from Canada. What I love the most about this one is that it included members from every area of the department, not just officers, and there were so many of you in it so people know you work together well! Great job everyone! I think Norfolk police department might have just out-Bruno Mars-d the man himself.